Experts say it takes 21 days to form a new habit, imagine what can happen in 30 days ! “30 Days of THINK” is a contest for students to promote positive use of social media. The goal is to get students ‘THINKing’ about how they use social media and to be responsible and respectful online. 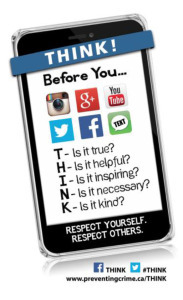 A menu of social media challenges will be issued each week that will encourage students to think first (before posting), think kindness, think respect, think support …all qualities of a good digital citizen. Create a meme, post a photo, send a tweet, create a video, make a poster, do a poetry slam, be creative…be positive and inspiring with the messaging. Entries will be submitted via Facebook, Twitter, or Instagram. Weekly winners will be randomly selected from all submitted entries. Winners will be announced via Social Media each Friday in November.